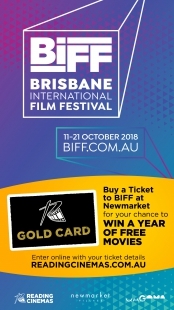 The Brisbane International Film Festival is coming to Reading Cinemas Newmarket and to celebrate, we’re giving our fabulous customers the chance to WIN FREE MOVIES FOR A YEAR with a Reading Cinemas' Gold Card! What did you love about your Brisbane International Film Festival experience at Newmarket? **1 entry per ticket purchased - ticket serial number, E-Tix confirmation code or QTix ticket code required for entry.